Guide to Mount Kenya and Kilimanjaro edited by Iain Allan. This book describes walking and climbing on the two highest mountains in Africa. It is targeted mainly at climbers and alpinists but it also is of good general interest since it describes the walking routes, flora, fauna, geology and history of the two mountains. Mountains of Kenya edited by Paul Clarke. 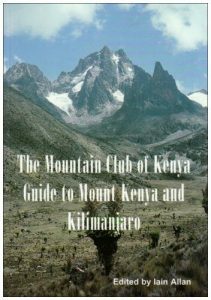 The book describes 100 mountains and summit walks in Kenya and each mountain has a proper description of how to get there, where to camp and what route to take up it. Both these books are available in many of Nairobi’s bookshops or directly from the MCK or from our distributors in the UK and USA. The MCK has also published climbing guides to the following crags close to Nairobi: Lukenya (vols. 1 and 2) Frog, Ndeya, Hells Gate. In addition the Club publishes a monthly Newsletter and a yearly MCK Bulletin. These publications are mainly for the members, but they also give interesting accounts of trips to mountains in East Africa and elsewhere. The Mountian Club of kenya has climbing booklets for sale at social events.